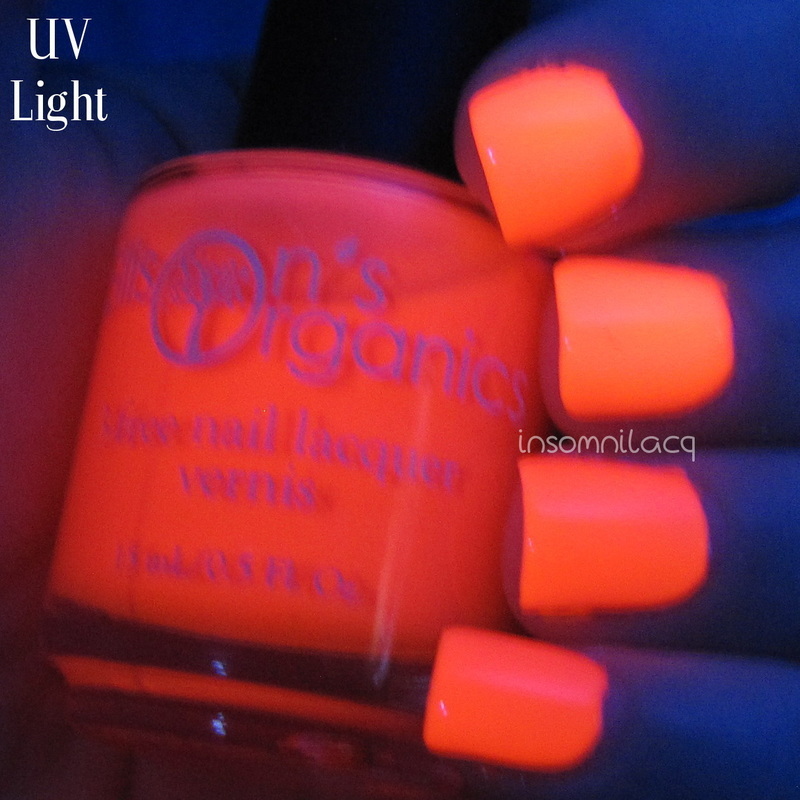 Ellison's Organics recently released a new collection of matte, neon, UV reactive, glow-in-the-dark polishes. I'll let you read that again: Matte. Neon. 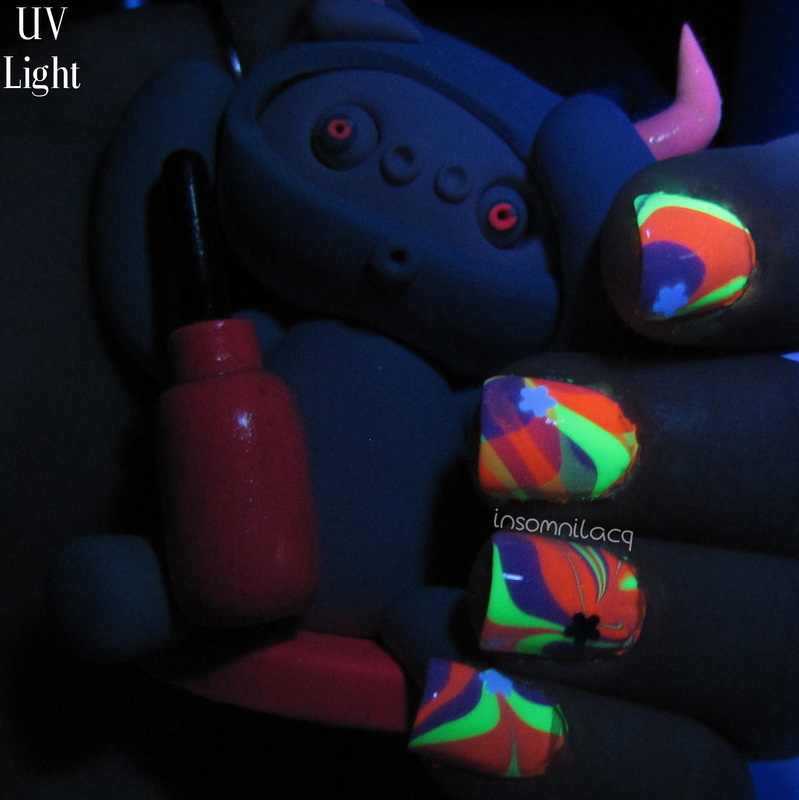 UV reactive. 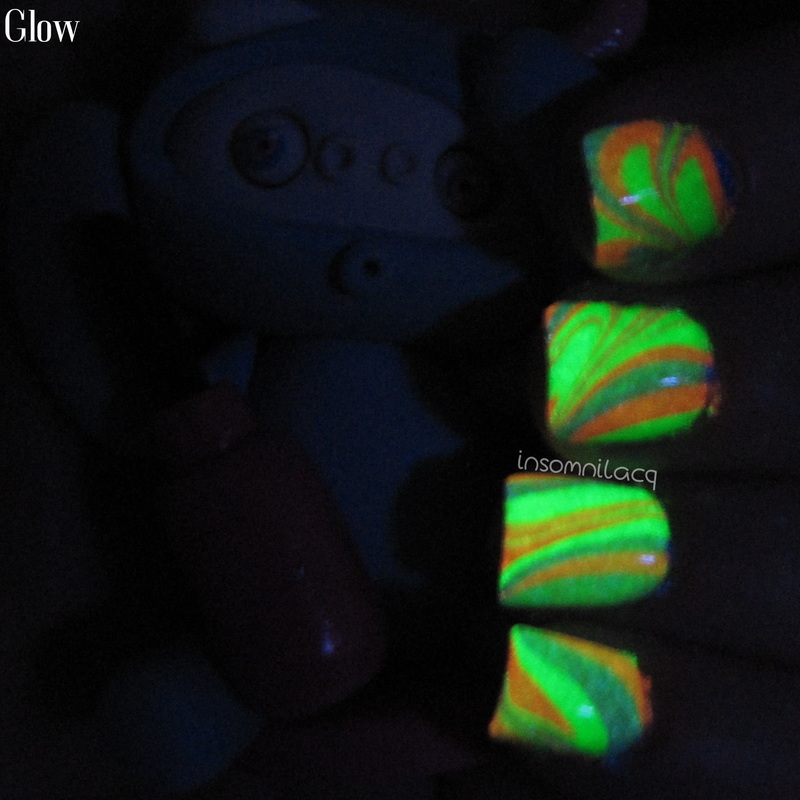 Glow-in-the-dark. Just imagine the amazingness of the collection based on that description alone! The collection consists of 9 polishes (3 shades of pink, an orange, a yellow, green, two blues, and a purple) all with very flattering names such as Enchanting and Irresistible. Many indie brands have been coming out with neon collections this season and it's been really exciting for me as I adore neons, especially blues and greens, but Ellison's Organics neons really stand out from other brands with this because of the glow factor which makes these polishes great for a summer day or a summer night. 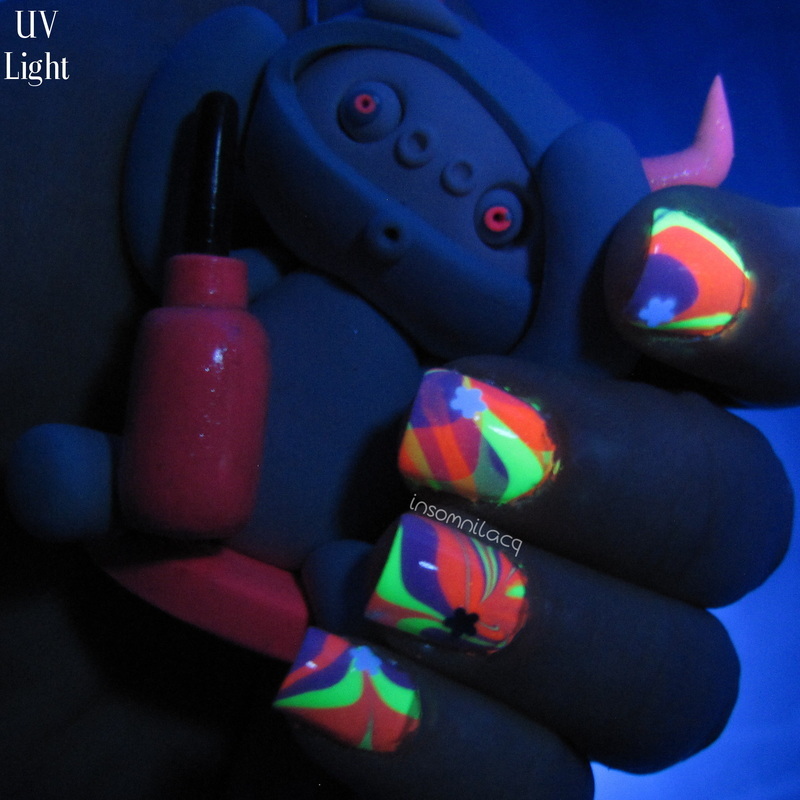 Neon coral-leaning hot pink that glows hot orange/pink under UV light and bright orange in the dark. I'll admit that I'm normally not a fan of pinks but Stunning feels like the perfect pink poolside pedi polish! I'm trying to decide if I like the color more under regular lighting or UV lighting and I just can't decide. Either way, if you're in the market for a neon pink polish this is definitely the one I'd suggest, I think it could compliment all kinds of skin tones. Photos show 2 coats over white with Elemental Ward. Bright magenta-leaning purple that glows pinkish under UV light and a purple-blue in the dark. This is the only polish in which the matte photos actually turned out right. Both Stunning and Talented dry with this same finish so use your imagination! Unforgettable was very nearly my favorite polish out of the 3 I tried due to its wide range of colors shown in various lighting but it was a photo finish and it took a very close silver medal behind Talented! 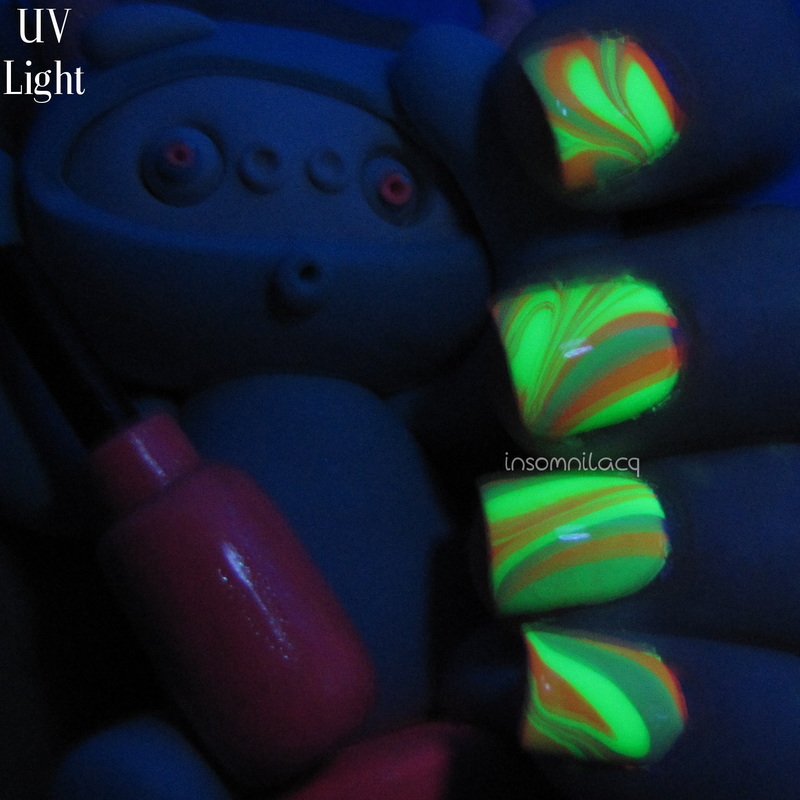 Vibrant neon green that glows lemon-lime green under UV light and bright green in the dark. I've been searching for the perfect neon green for months and then this baby strolled into my life. It doesn't have the same range of color within it as Unforgettable (though I'm in love with its UV color) but it is the exact shade to match what I have in mind when I think of my perfect neon green. I also got a bottle of liquid latex to play around with. I'd never used it before but I have to say it was surprisingly easy and fun to use! 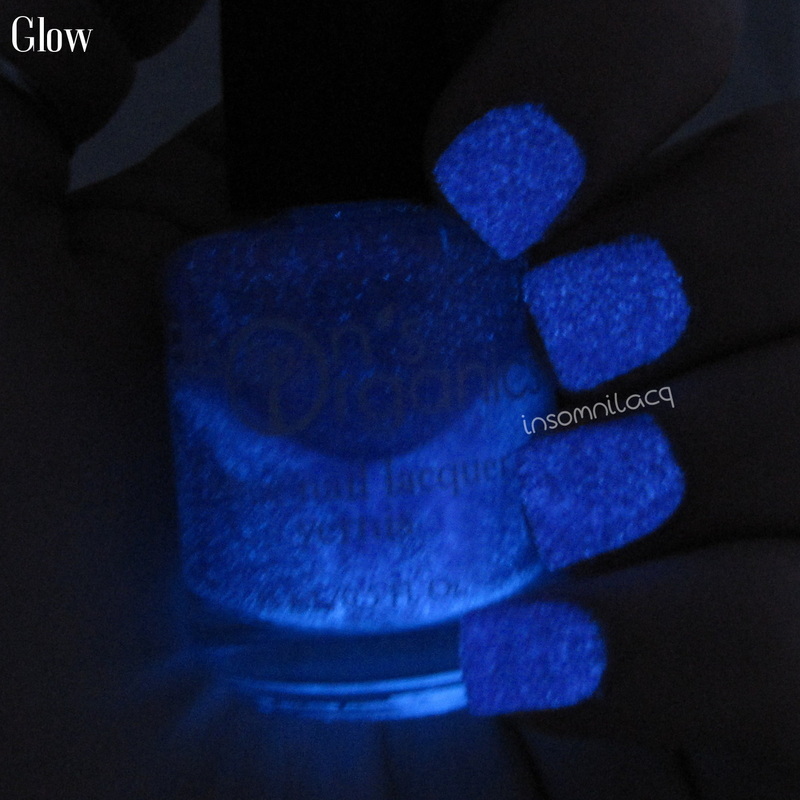 It dried on my skin very quickly and wasn't too hard to apply around the nail. However, I had to be careful once it dried as it stuck to the latex on my other fingers if they got too close to one another--such as while taking the pictures shown below. This liquid latex finally gave me the courage to attempt water marbling for the first time in months. For my first water marble I only painted Mani Defender up to my first knuckle. It certainly helped with clean-up but I was left with a fair amount of polish still partway up my fingers. It was still way easier than trying to carefully scrub around my nails with acetone on a Q-Tip though, and I love how the marbling turned out! It dulled the vibrancy of the purple and pink a little but the green really pops out and it was gorgeous under UV and in the dark. I had learned my lesson, though. For my second water marble, I applied Mani Defender around my white-painted nails up to my first knuckle (making sure to also get the tips of my fingers under my nails), then put cheap-o packing tape up to my second knuckle. This was a good balance between ease of removal and not using all of the precious liquid latex! 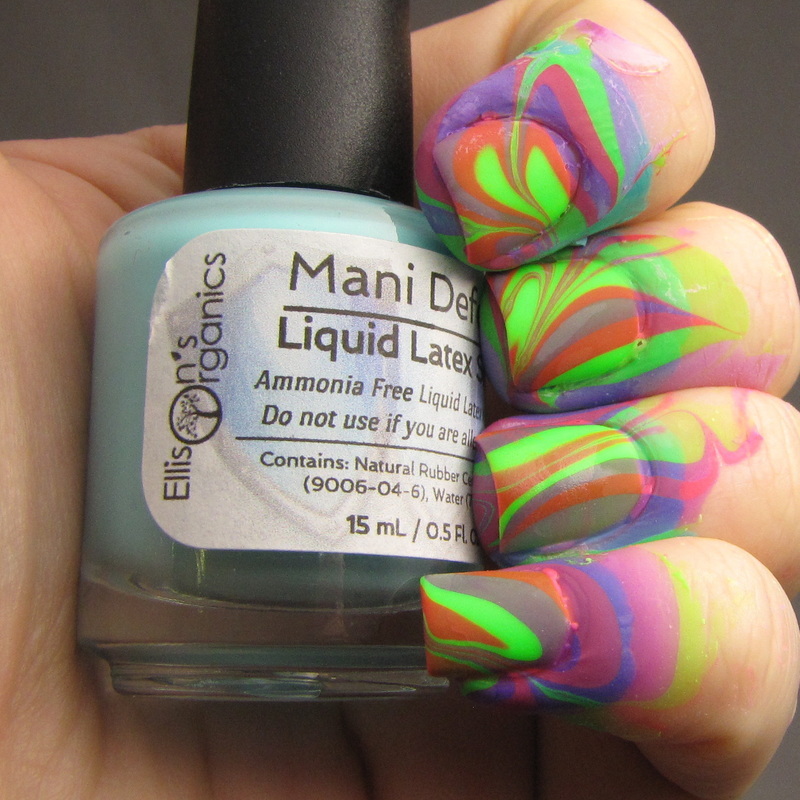 I was left with some very hard-to-bend fingers, but plenty protected from the perils of water marbling. A world of yes! I double-dipped my middle finger since I had a huge white spot after the first dip, then I added some little flower glitters I had lying around, and BOOM! Super simple and super summery. I took a few pictures with my Little Lazies figure and just admired my nails all night, instead of scrubbing polish off my nails all night had I not used Mani Defender! You remember me mentioning this stuff was surprisingly fun, right? I first tested it while swatching Unforgettable to see if it helped keep my cuticles and the skin around my nails clean while applying polish. I then proceeded to apply nail polish more perfectly than ever before, not getting a drop around my nails! The fun part comes when it's time to remove the Mani Defender. Grab a pair of tweezers, peel up a corner, and just...enjoy it! Ooh yeah, that's the stuff! It reminds me of peeling Elmer's Glue off of my hand as a kid. As a young teen I learned that Super Glue does not give you that same satisfying peel, though, as it takes about 90% of your skin with it. Yeah, this stuffs a lot more fun than that. 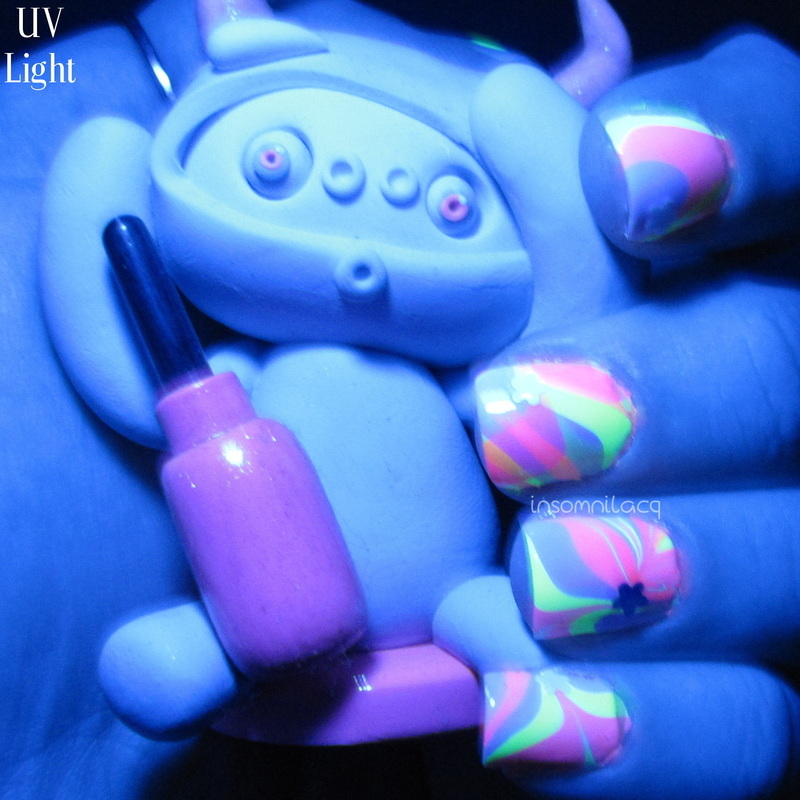 I was able to reach full opacity with the neons themselves at 4 coats, but 2 coats over a one-coat white looked great and really brought out the vibrancy of the neons. A minor inconvenience that was worth the effort! 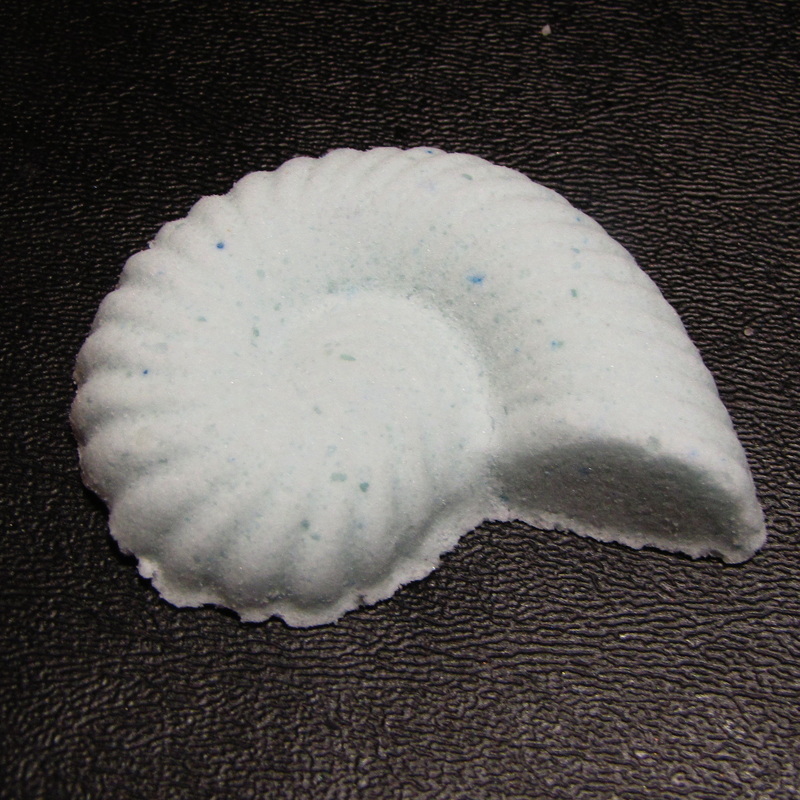 The formula was very easy to work with and even worked great for water marbling. $12 for 15ml on Etsy. On the higher end of the price scale as far as indies go but the formula was very easy to work with and you get free shipping with orders $50+! They also do sales on occasion so keep an eye on their Facebook page. My water marble lasted 3 days with minimal tip wear before I finally removed it for a new mani. 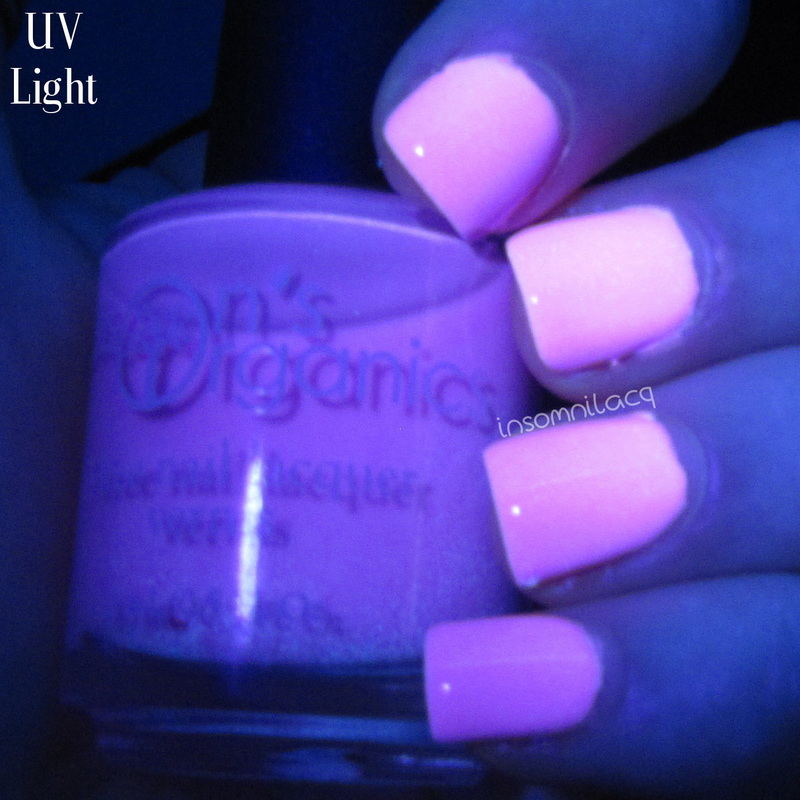 There are a lot of brands doing neons this season but the glow-in-the-dark aspect of EO's neons is fantastic! I heard about Ellison's Organics a few months ago but this was my first time trying their polish and I was very happy with it all. Their shop also has a bunch of different organic beauty products like cuticle oil and soaps in a bunch of wonderful scents! Be honest--how many of you are gamers? I certainly am! But even if you're not, you're going to love Rainbow Honey's newest collection inspired by Final Fantasy VII. I love that Rainbow Honey has been doing so many collections inspired by video games recently. I really hope she has more game-inspired polishes up her sleeve! The Final Battle collection is broken into 3 parts: The Battle, The Summons, and The Weapons. The Battle is made up entirely of glitter toppers and The Summons is a mix of glitter toppers and jelly glitters. The Weapons is full of gorgeous shimmer creams. Below I have one polish from each part of the collection to share with you. 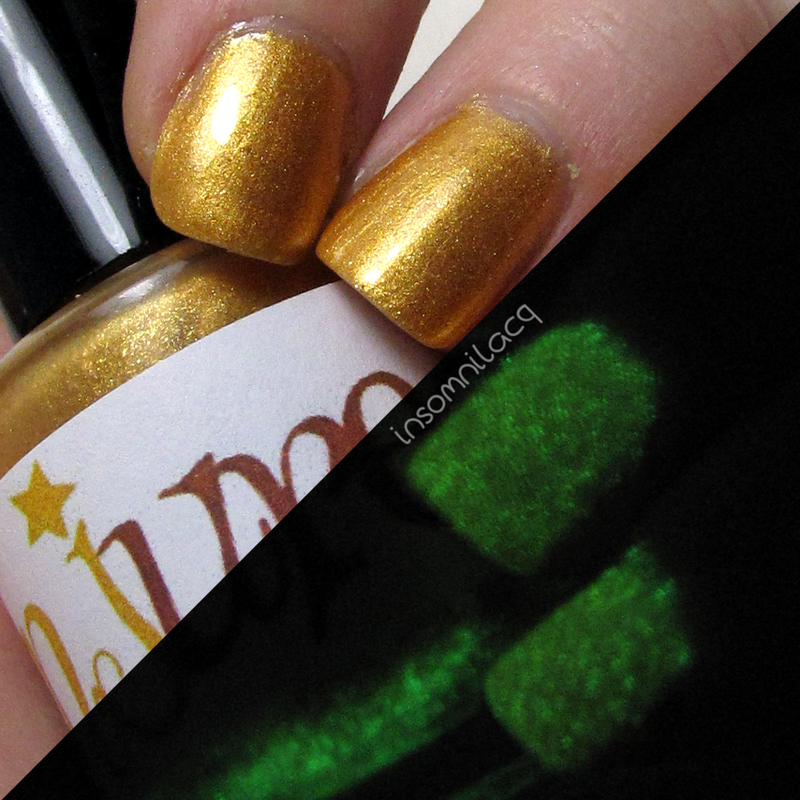 Meteor - The smoldering metals and minerals shine through in this clear base full of black, gold, and fiery glitters. One coat is shown over NYC Mint Macaroon. Tera Flare - A strong violet flash hides in a blackened base beaming with holographic teal, blue, and silver glitters. I really was expecting this one to be my favorite of the bunch, I just love black jellies with tons of glitters. I personally didn't notice much "violet flash" but regardless this color is simply stunning. It was a little harder to work with due to the amount of glitter and I needed a second coat of topcoat but it was a minor inconvenience. 3 coats shown over bare nail. 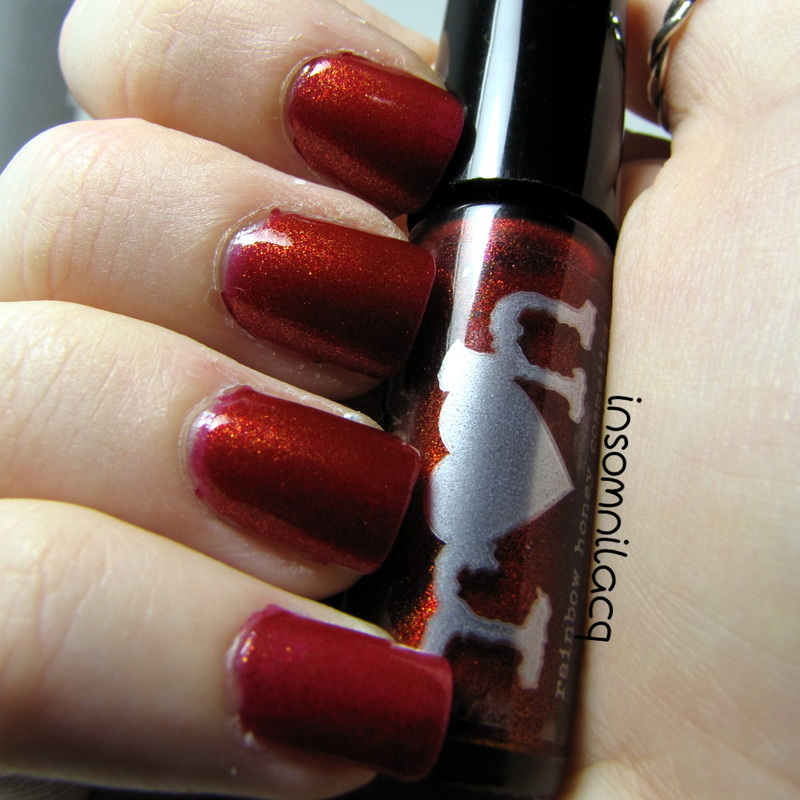 Ruby Weapon - A darkened ruby red with copper and gold shimmer. I've mentioned before that I'm generally not a fan of red lacquers but Rainbow Honey has once again blown me away, though, and proved that I can love reds! Ruby Weapon is so deliciously fiery, and I'm thinking it could make for an amazing Christmas manicure (perhaps paired with Ivy's Kiss?) or Valentine's Day. This one was super smooth to apply, I had no issues whatsoever with getting even coverage. 3 coats over bare nail. The Final Battle collection is available here right now! There's a stunning glitter topper called Diamond Dust that I have got to get my hands on! Which of these are on your holiday list?? A few weeks ago Insomnilacq passed 2000 Likes on Facebook, WOO HOO! To celebrate I'll be giving one lucky winner two prizes! First up, a four-piece Candie's nail polish set. It's brand new and was only opened to get the names of each color to try to find swatches (with no luck, sadly) and to pad it with bubble wrap for shipping. 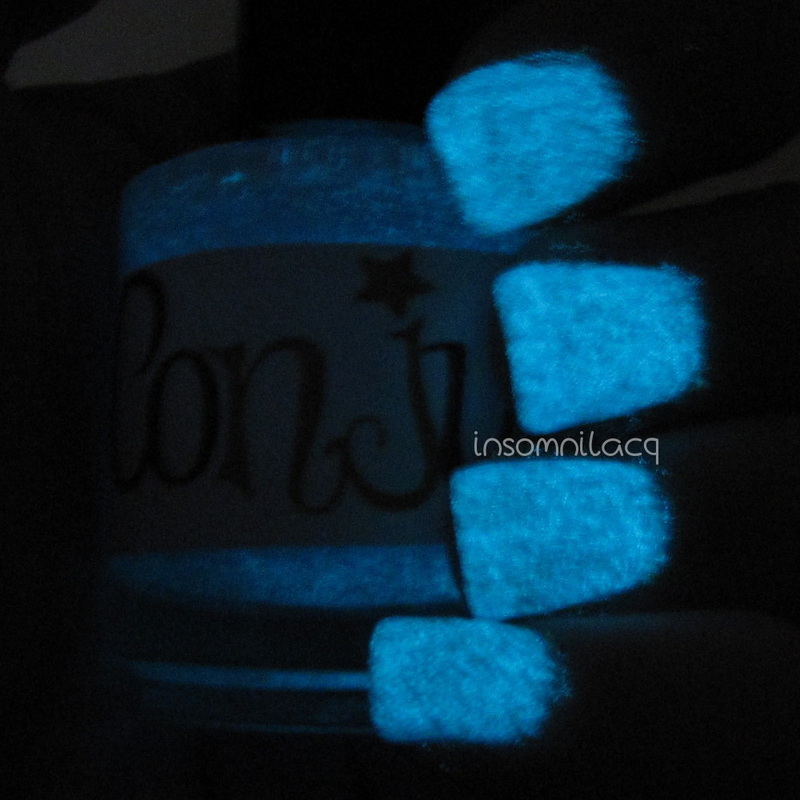 The colors included are Arctic Waters, Iced Over, Electric Vibes, and Carbon Dust. 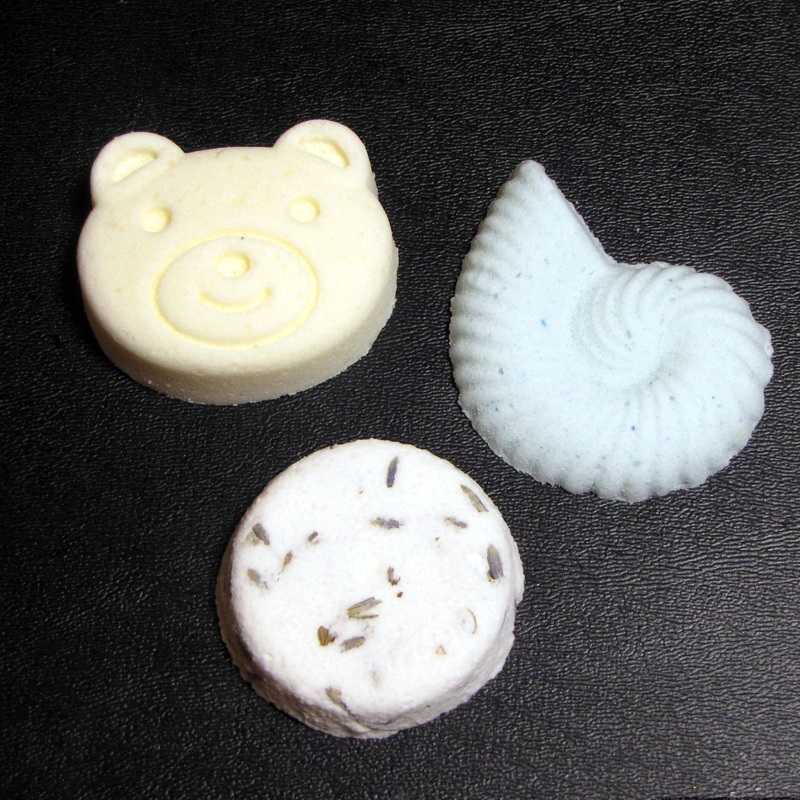 The second portion of the prize will be $10 worth of goodies from the Insomnilacq blog sale! It's good toward any items: nail polish, cosmetics, or jewelry, and I'll cover shipping! 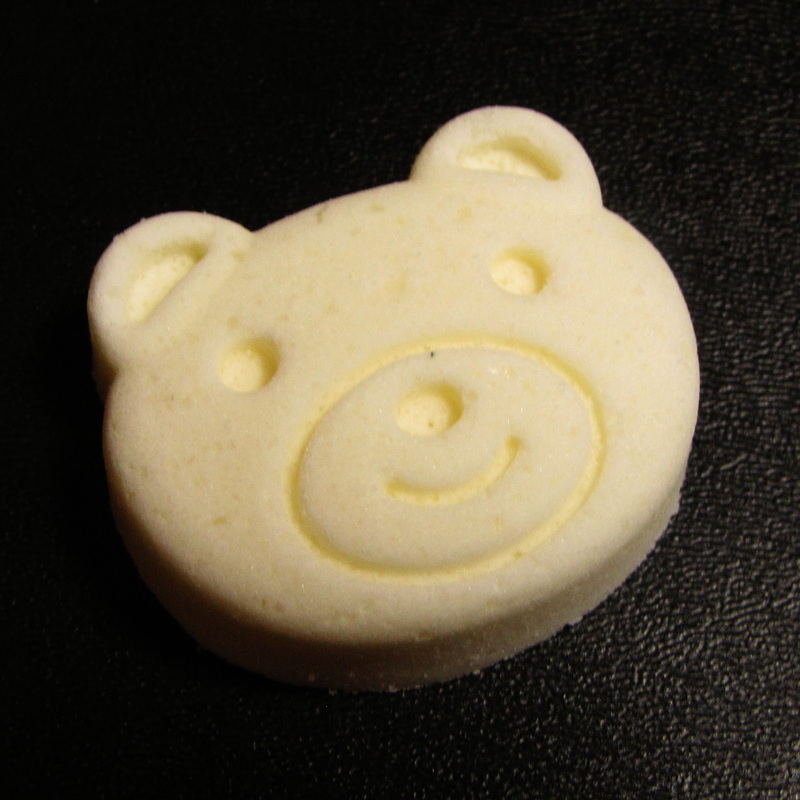 If you want to add more blog sale items I'll cover the first $10 worth of products and the first $3 of shipping costs. Below are just a few possible items you could choose as your prize. This giveaway is US only, unless you have a US address I can ship it to. Ends 11/1. Good luck! Growing up I was in love with ancient Egyptian mythology. All the gods and goddesses, part human, part animal, and with a deity for just about anything you can imagine, it was all so fascinating, I distinctly remember in 6th grade reading everything our textbook had to say on Egyptian mythology, not just the few pages that were assigned, and wishing there was a place in our society for a polytheist religion. It makes sense to me to delegate certain tasks to different people, let one god be in charge of one group of prayers and everyone is heard! Loved one passed away? Pray to Anubis for their safe passage to the underworld. Your sister is having a baby? Pray to Bes or Hathor for her safe delivery and joyful motherhood. When I heard that Daphine Polish had a collection inspired by Egyptian goddesses you wouldn't even understand how excited I was. It was like one of the best parts of my childhood could finally join me in my adulthood! I have two of the 6 polishes from the Goddess of the Two Lands collection so let's get right to it! 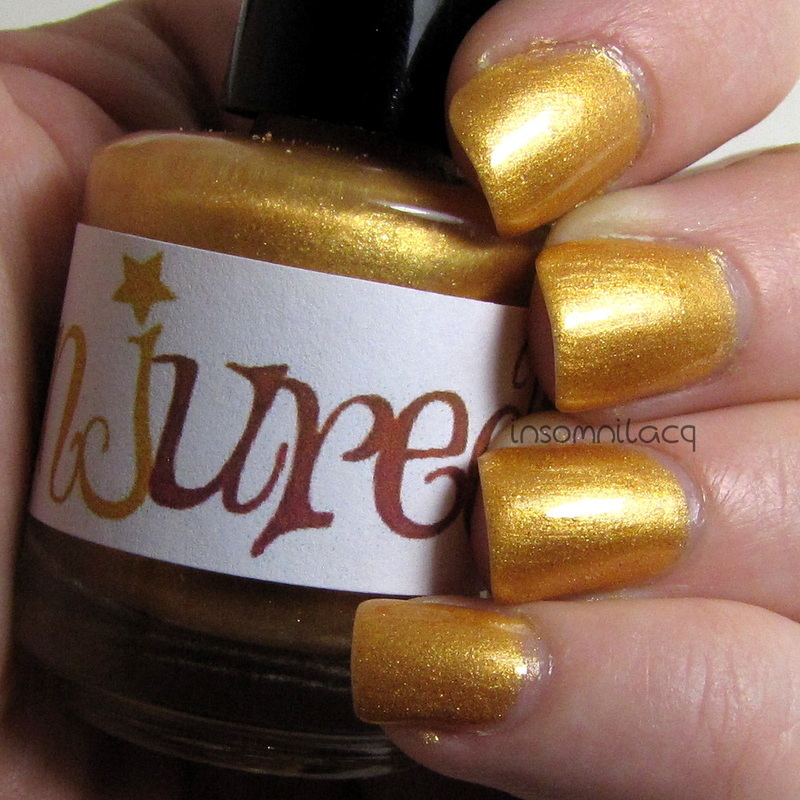 I first tried Hathor with two coats on its own, as you see above, but I found that some of the larger gold glitters from the first coat got lost in the opacity of the second coat. What better time to try some lovely undies with this beauty! I found that one coat over CoverGirl Midnight Magic made for an even more gorgeous manicure. The mild amount of sheerness for Hathor allowed the duochrome of Midnight Magic to show through and I was simply stunned with what was left on my nails. I'm going to love finding other coordinating colors to wear under this one! I'm thinking a dark creme would really allow the emerald base and gold glitters to pop. Anuket (the goddess) is the personification of the Nile river. Anuket (the polish) is a rich brown with orange glitter and a hint of holographic sparkle. It's also a one-coater. Yes, you heard me right, one coat for full opacity! And it's such a perfect Fall color, as well; now is the time to add it to your collection! So of course my favorite part of Anuket is seriously, one coat! As someone who paints her nails so often it's really a relief to not need to dip in for that second coat and instead to be able to reach straight for the topcoat. My second favorite part of this polish, however: tiny rainbow shimmer! The sun was actually out when I was wearing this one!! See below for blurry rainbow goodness. $10 for a full size (16.5ml!) on Etsy and Storenvy. She also offers discounts for ordering the whole collection! I had such great wear time on this I actually lost track of how many days it lasted! 4 days, 5 days, who knows! I've never seen a collection inspired by Egyptian goddesses, I love it! I just learned of Daphine Polish but I am definitely impressed! The entire collection will be wonderful for Fall: dark but still muted shades that shimmer when the sun comes out to play. Daphine Polish also has very nice, long caps for her bottles which made it very easy to adjust my grip and paint those hard-to-reach corners of my nails which was very nice. Finally, Daphine Polish has a Daria collection. Yes, Daria, that show on MTV from the 90's with the smart, acerbic, misanthropic teen that I totally identified with. What can I say, I definitely wasn't one of the "cool kids" in high school! Have you tried Daphine Polish yet? Which of the Goddess of the Two Lands collection is your favorite?? Ah, stamping. My favorite and least favorite form of nail art! Stamping allows you to create such gorgeous manicures but somehow I always end up smudging the design or not waiting long enough for my base to dry, smooshing everything, and completely ruining it! This time, however, I had huge success!! Joy at Nail Polish Canada recently contacted me to see if I was interested in reviewing one of the new Konad plates and even allowed me to choose which one I wanted. How could I say no to an adorable kitty-themed plate, especially when it has a whole-nail paw print pattern?! I felt that, given the cat theme of the plate I really had no choice in polish for this manicure. It had to be the polish I recently made (for my personal use only as it's not licensed by the creators, I'm sorry!) inspired by Pusheen the Cat! The moment I saw this plate I was in love with that whole-nail paw print dealie so is it any surprise I immediately began on this mani? Just look at how cute that is!! Next up I decided to try the cute little kitty at the bottom of the plate, the one with the heart on its tail. Once again, so much cuteness! This plate is definitely a genuine Konad and I had no problems at all transferring the image to the stamper and then to my nail. You can probably see that in the pictures above I didn't topcoat my accent nail, and I'm glad I took pics before topcoating. Apparently Essie's Good to Go is not a good topcoat to use if you don't want smearing! My whole experience with Nail Polish Canada was excellent. Very fast responses to my emails and super fast shipping! 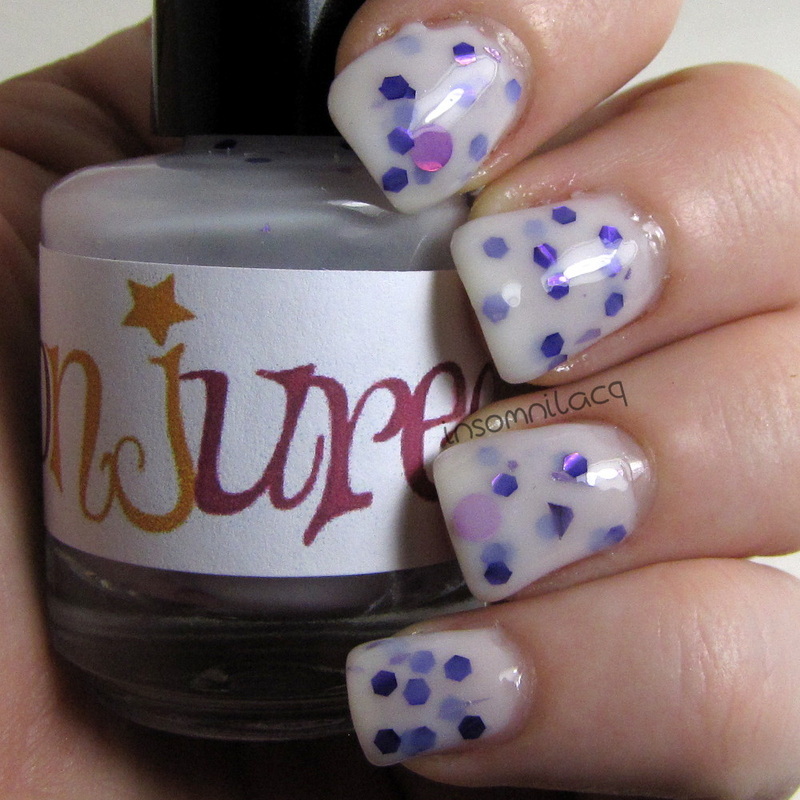 Their site has a ton of different products, too, including tons of indie polishes!! NPC even has an entire section with free shipping (no minimum!!) with tons of stamping plates and other nail art supplies. It's a limited time deal though so do your shopping now! And finally, Nail Polish Canada is also hosting a giveaway for 5 of the recently released Konad plates. Click here and then click the hilighted area that says "Enter to Win 5 New Konad Image Plates! (click here)" to enter your information. NPC's giveaway ends September 15th so there's still plenty of time to enter! 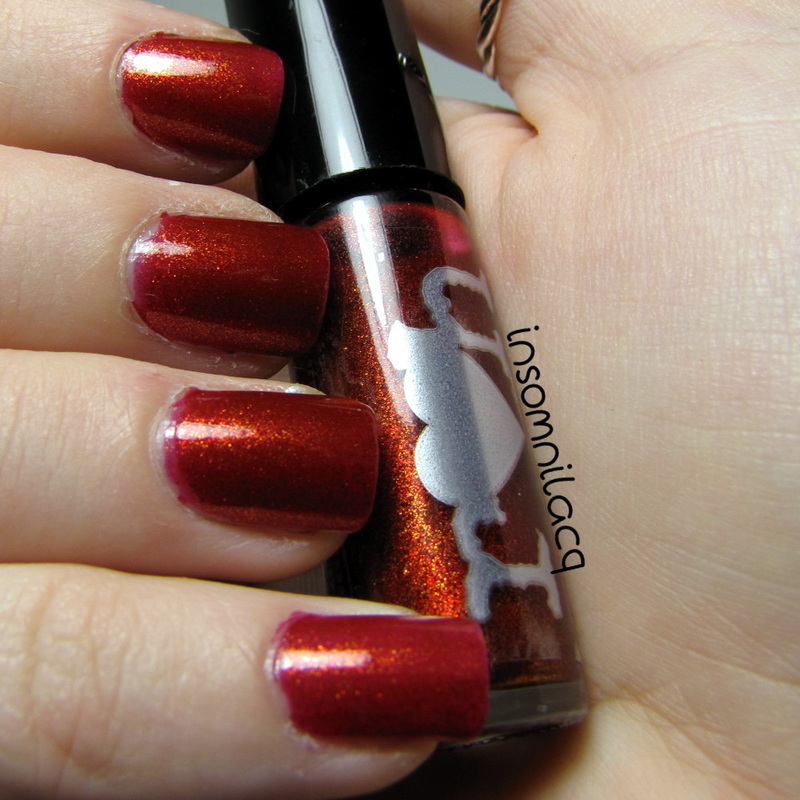 Lucky 13 Lacquer >● ⋏ ●< Meow! Lots of hope and patience! What's your favorite Konad plate? Or non-Konad for that matter! 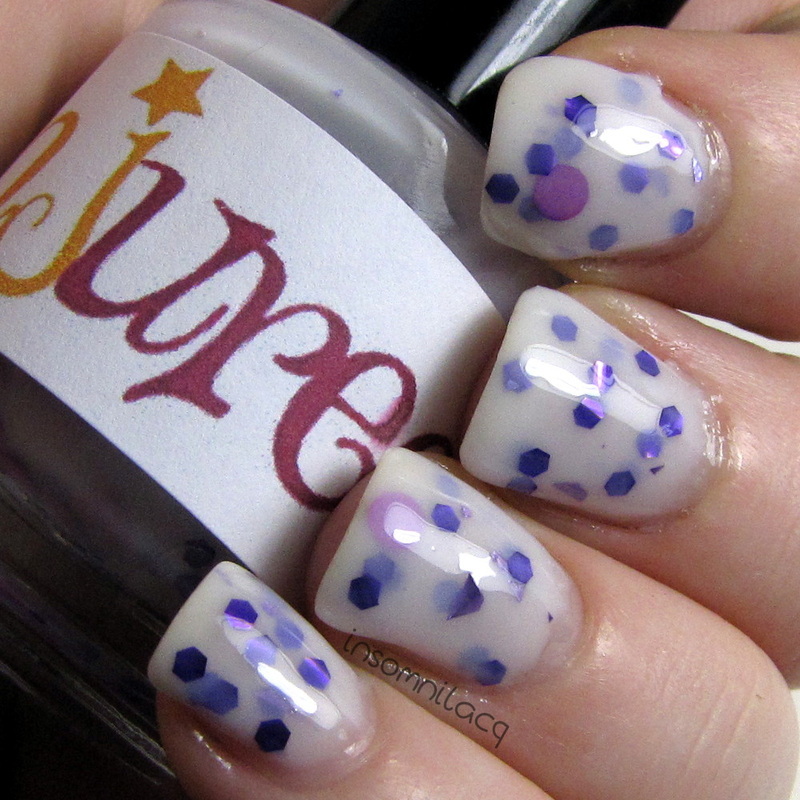 And what's the best topcoat/method to use with stamping?? And if you love my Pusheen-inspired polish perhaps you could consider dropping a line to Pusheen and saying you're interested in an officially licensed Pusheen polish! Oh, and please pardon my nubbin-y index finger, we recently suffered a tragic breakage and she had to be severely trimmed. For the last two weeks I've been waiting very impatiently for Facebook to change my blog's name and the time has finally come! To thank those of you who have been here with me for a long time (and to welcome those of you who are just finding my little corner of the Internet) I'm giving away 4 Sally Hansen Sugar Coat polishes in Cotton Candies, Sour Apple, Razzle-berry, and Bubble Plum. Do you guys still love the textured thing? I never really got into it but I saw these and couldn't resist picking them up for you folks! One lucky winner will receive all 4 of these polishes.